Israel's military establishment continues to maintain a high alert along the Egyptian border amid fears of an imminent terror attack. Israel's military establishment is continuing to maintain a high alert along the Egyptian border amid fears of an impending terrorist attack. 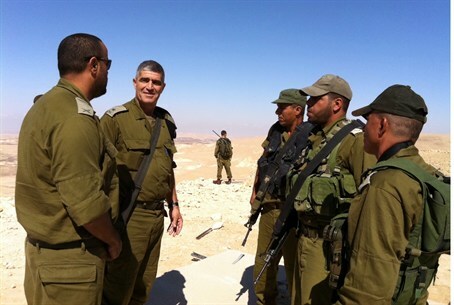 OC Southern Command Maj.-Gen. Tal Russo toured the area Wednesday, meeting with soldiers stationed at strategic checkpoints along the border. The IDF is hoping to prevent a repeat of the Aug. 18 multi-pronged terrorist attack that left eight Israelis dead, 40 wounded and its diplomatic relations with Egypt tense for days. Five Egyptian soldiers were also killed in the melee as Israeli security personnel fought a bloody battle with more than a dozen gunmen from the Gaza-based Popular Resistance Committees (PRC) terrorist organization. Parallel investigations by the IDF and Egyptian security later revealed that at least three of the 20-plus operatives involved in the attack were Egyptian nationals. Meanwhile, authorities have revealed the identity of the perpetrator of a separate terrorist attack executed earlier this week in Tel Aviv. Muhammad Sa'afan, a 20-year-old resident of the northern city of Shechem, was caught on site after having stabbed eight people at a club in south Tel Aviv. One of the victims was critically wounded in the attack. Sa'afan was remanded for an additional 10 days by the court.